Please join Gallman Consulting and GPS in wishing a very Happy Birthday to Donna Byrd, a wonderful and inspiring colleague! Your birthday is a promise that life has more to offer you, more plans to make, more goals to reach and more dreams to see come true. Donna, it’s a pleasure to wish you a happy birthday! Donna is a Director of Placement at Gallman Consulting. 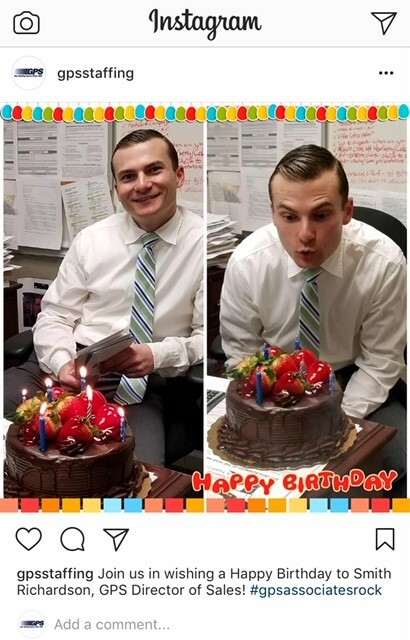 Please join Gallman Consulting in wishing a Happy Birthday to Smith Richardson, GPS Director of Sales! Happy Birthday to a great colleague! Smith, we hope all your birthday wishes come true, today and every day. Wishing you the best of blessings on your birthday! Happy Birthday Suzanne Young! May all your birthday wishes come true, today and every day. Your birthday is a promise that life has more to offer you, more plans to make, more goals to reach and more dreams to see come true. It’s a pleasure to wish you a happy birthday! Karen is celebrating her 19th GPS Anniversary today! Happy GPS Anniversary Karen Smith! Karen, thank you for being part of our company’s success over the years. We greatly appreciate and value your hard work and dedication. Congratulations on another successful year in your career. May you take some time to reflect on your accomplishments and be blessed with continued growth and prosperity in the years ahead. We could not do ALL of our jobs without YOU!